It is not often that I can say this, but for the season ahead I am hugely optimistic. The high water has really flushed the system, even the dear old dirty old Tamar is showing shining gravels as you wade. All the springs are running full bore, and will continue do so for quite some time to come. Levels for salmon and sea trout to run are excellent, and the strong flows of clean water are really envigorating the wild brownies, with excellent prospects for the rest of the summer. I can’t wait to go fishing! With the wettest April ever recorded, it is hardly surprising that rivers at Lifton have been in various stages of spate for weeks. The really good news is the timing of this water, which gave the salmon and sea trout smolts a safe passage into salt water, unlike the past two seasons where the smolt run took place during very low flows, with obvious risks of predation. Migratory fish took advantage of the high flows to press well upstream, with the first spring run of salmon already well distributed throughout the main Tamar and also into the larger tributaries. 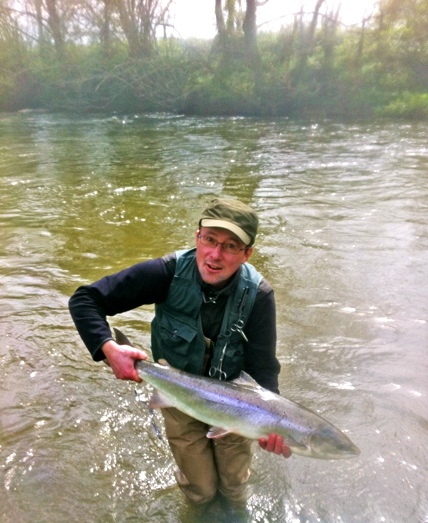 David Pilkington, inspired by a good flow of clearish water in the Tamar on the 20th of April, tried for a ridiculously early sea trout on Beat 7a, and hooked the earliest ever sea trout for the Arundell Arms water. After a spirited fight the fish jumped and came off the fly, revealing itself as a spanking fresh fish of some 3 ½ pounds, saving David the trouble of unhooking it prior to release. A few other sea trout have since been taken on the lower beats, and will push through very quickly on the high flows.